The latest addition to Lisheen's line of edcational games, Bingo! 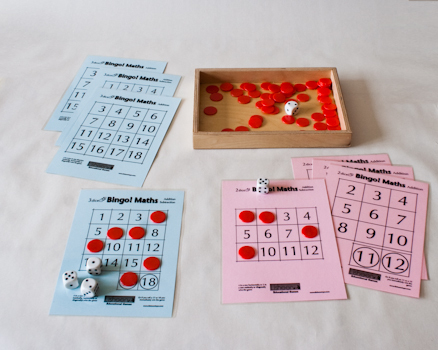 Maths aims to teach children numeral recognition and basic numeracy. A game 2+ players. Though each kit comes with equipment enough for four, the game can faciliate any number of players. The players take it in turns to roll the dice and place counters on the appropriate numbers on their cards, with the aim of filling a line and getting a Bingo! The simplest cards feature only one dice, therefore the game is one of associating the dots on the dice (quantity) with the numerals 1-6. As you add dice the games increase in difficulty. For example, 2-Dice-Addition requires players to add together the numbers on the dice (e.g. 5+2) before they place the counter on the correct number (7). 2-Dice-Addition-Subtraction lets players add OR subtract the two numbers, so a 5 and a 2 allows players to place a counter on the numbers 3 or 7.